Currently, President of the Republic of Uzbekistan Shavkat Mirziyoyev is in the Federal Republic of Germany with an official visit. On the second day of the visit, the Uzbek President Shavkat Mirziyoyev met with the Minister-President of Bavaria Markus Söder in Munich city. The head of our state signed the book of honorable guests. Bavaria is a home to about 12,9 million people. It is located in the southeastern Germany occupying an area of 70,5 thousand square kilometers. It is the second largest state in the federal republic by area and the number of population. Today Bavaria is one of the most economically developed regions of the country. The gross regional product of Bavaria is close to € 600 billion, this is higher index than in most EU member states. Approximately half of the German air and aerospace equipment, 43% of textile products, 27% of electronics, 18% of machinery and 12% of metallurgy are in this federal state. At the beginning of the meeting, Mr. Mirziyoyev congratulated Markus Söder on his election as chairman of the Christian-Social Union of Germany and expressed his confidence that this high-profile activity will promote the further development of bilateral cooperation. During the meeting, the sides discussed prospects for further development of bilateral cooperation. They also exchanged views on trade-economic cooperation. The Uzbek President noted that during the negotiations with Federal President Frank-Walter Steinmeier, Federal Chancellor Angela Merkel and Bundestag Chairman Wolfgang Schäuble, mutual understanding and cooperation projects were supported. Traditionally, relations with Germany have covered a wide range of cooperation areas. In particular, a solid legal agreement framework has been established between the two countries. 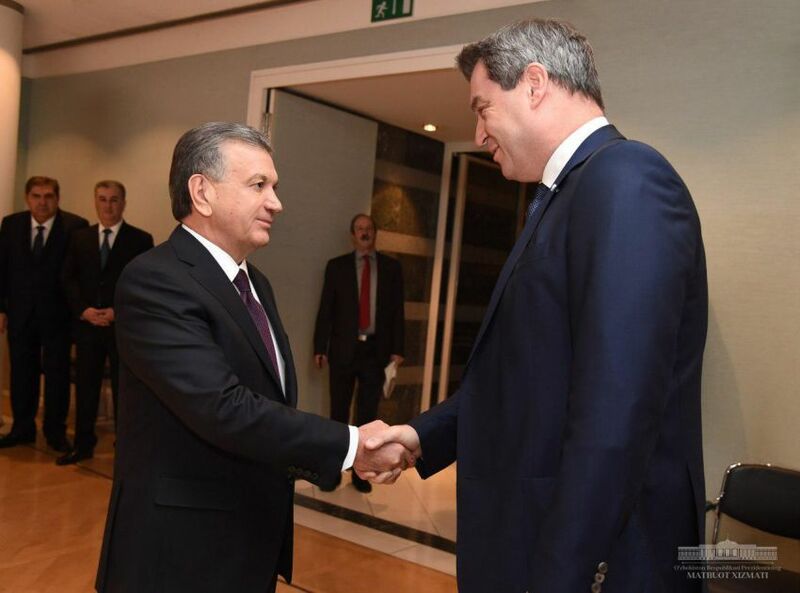 Bavaria's Minister-President Markus Söder said he was glad to see the President Shavkat Mirziyoyev in Munich. He also noted that the documents signed between Germany and Uzbekistan would serve the interests of the two countries, effective and mutually beneficial trade-economic cooperation would be one of the most important priorities of bilateral relations. It is noted that the relationship between our country and Bavaria has a long history. Written memoirs of the historian Shilterberg about his presence at the receptionist of Amir Temur are one of the first documented sources of historical ties between our peoples. 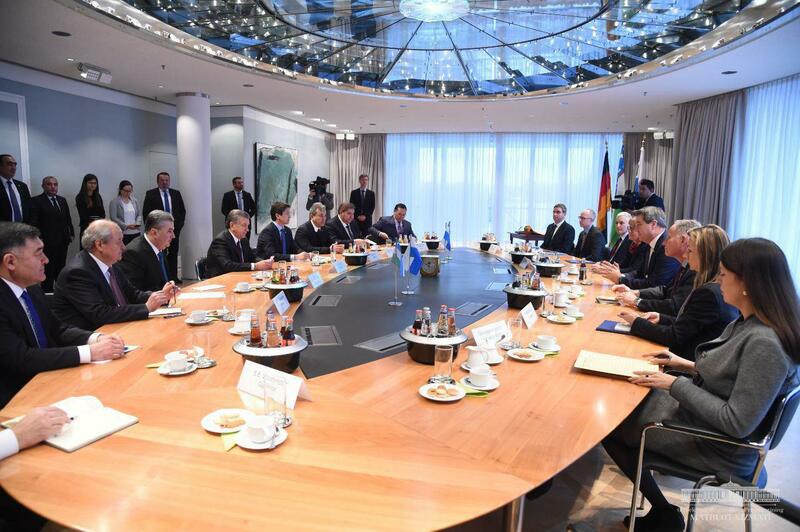 The parties noted the interest in strengthening trade-economic and investment cooperation, wider introduction of advanced German technologies in various sectors of the Uzbek economy. Particular attention was paid to the issues of expanding cultural-humanitarian cooperation, higher education, healthcare and sports. At the meeting, the prospects of German companies' cooperation with Uzbekistan in creating hi-tech enterprises, modernizing transport, logistics and tourism infrastructure, co-financing trade and joint projects were discussed. Markus Söder expressed his sincere gratitude to the President Shavkat Mirziyoyev for the support provided to the German business circles in Uzbekistan. Moreover, the Minister-President pointed out that he is extremely interested in a large-scale and mutually beneficial business partnership with Uzbekistan. Our President presented to the Minister-President a book-album about the historical monuments of Uzbekistan, kept in the German museums.